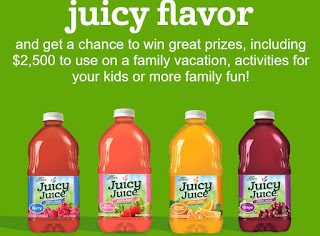 JUICY JUICE® “WHAT JUICY JUICE FLAVOR ARE YOU?” SWEEPSTAKES OFFICIAL RULES PRIZES & APPROXIMATE RETAIL VALUES (“ARVs”): Two (2) Grand Prizes – 1 winner per Entry Period: A $2,500 check for the winner to use towards a family vacation, activities for children or whatever the family desires. Ten (10) First Prizes – 5 winners per Entry Period: A $100 Sponsor-selected gift card and a Juicy Juice branded prize pack (including Juicy Juice product and a branded toy). (ARV: $117.49 each). Fifty-Seven (57) Daily Prizes - 1 per day during the entire Sweepstakes Period: A Juicy Juice branded prize pack (including Juicy Juice product and a branded toy). (ARV: $17.49 each). Total ARV of all prizes is $7,171.83.